A DECADE AGO, ITS LANDLOCKED GEOGRAPHY DID NOT GIVE KAZAKHSTAN MUCH REASON TO BOAST. NOW, THE CENTRAL ASIAN COUNTRY SEES ITSELF AS AN IMPORTANT LINK AMONG EUROPE, ASIA PA CIFIC AND SOUTH ASIA. 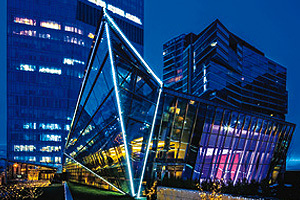 This vision is fuelling ambition, especially in its former capital, Almaty. It is a city with a long history — its former name, Alma Ata, means “father of apples”, as it is believed to be the first place on earth where apples grew. 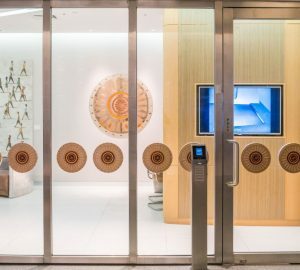 Today, Almaty remains the cultural heart and financial centre of the country, with wide streets, cool fountains and museums standing beside new financial towers. The contrast of rickety marshrutka minibuses alongside shiny new SUVs is just one sign of the contemporary vibe converging on the city. In winter, urban dwellers make their way to the Zailiysky Alatau mountain range, which stands on the border of the urban landscape. 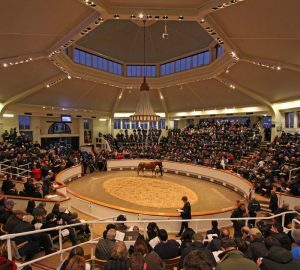 Almaty is now gaining more attention from tourists and investors alike, and its spot along the route of the planned 8,445km Western Europe-Western China Expressway is expected to attract even more visitors. Whether you’re just stopping over for refuelling or scouting for business opportunities, you can find top-tier comfort in some of the city’s best hotels. 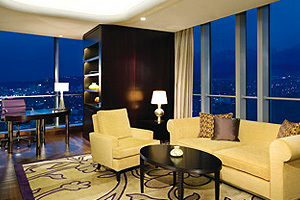 The Ritz-Carlton Suite, the premier accommodation choice at The Ritz-Carlton, Almaty, is nestled on the 27th floor of one of the tallest buildings in the city. Taking full advantage of its altitude, the suite features floor-to-ceiling windows, offering views of both the commercial centre and the Alatau mountains.With a floor space of 240 square metres, the suite comprises a bedroom, living room, dining room, meeting area, kitchenette and bathrooms. Warm beige tones are complemented by dark furniture made of stone and wood. 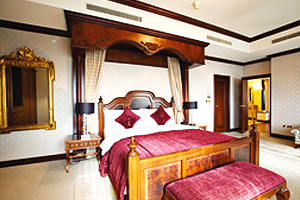 Suite guests enjoy personalised shopping and butler services. 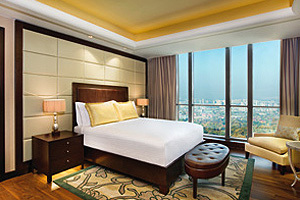 Its location makes the InterContinental Almaty a convenient base for exploring the city’s cultural destinations. A 10-minute walk brings you to the Central State Museum of Kazakhstan, while a five-minute car ride takes you to the Republic Palace, the Zenkov Cathedral and Kok-Tobe Mountain. 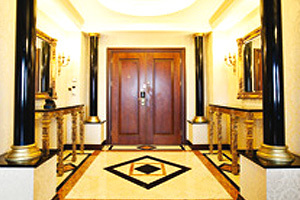 The hotel itself exudes a sense of elegance from a different time, with palm trees lining the lobby. 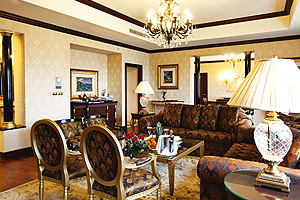 The Sultan Suite on the 11th floor follows the same mood, combining nostalgic sensibility with modern comforts. Dark wooden furnishings contrast with robin-egg blue covers, and Victorian-style curtains frame a view of the Tian Shan Mountains, one of the longest mountain ranges in Central Asia. The suite offers a master bedroom, dining room with full kitchen, sitting area, work desk and living room. 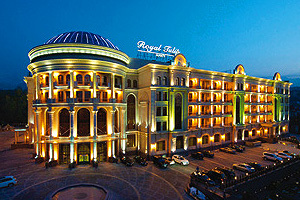 The Royal Tulip Almaty opened its doors in 2010 but its architecture reflects older eras. 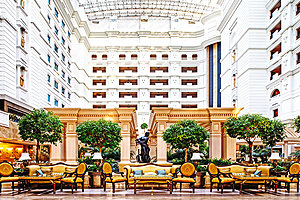 The hotel building features a blue dome perched atop a series of Roman pillars, while inside, a bright lobby welcomes visitors with ivory floors, gold leafaccented pillars, and chandeliers hanging from a tall ceiling. Mosaic and marble abound throughout the interiors. Shades of sand and beige dominate the hotel’s Presidential Suite, which comprises a living area, dining room, two bedrooms and two bathrooms. 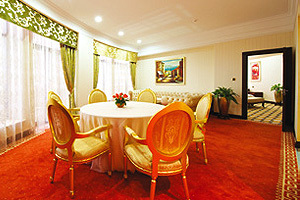 The hotel is en route to the Tian Shan Mountain range and is just minutes away from the Abay Opera House and the Medeo ice skating rink. For a more personal touch in Almaty, there’s Donatello Boutique Hotel, a property easily mistaken for a private colonial mansion owing to its Art Nouveau façade. 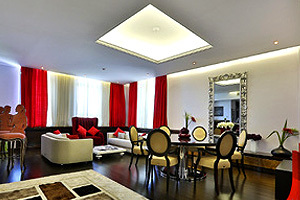 A contemporary arts theme, though, dominates rooms and common areas. The hotel’s best room — the 110sqm Donatello Suite — features a monochromatic palette interspersed with bursts of colour and pop culture references. It comes with a studio, private bar, living room and dining area. Tucked away in an upper-crust district of Almaty, the Donatello Boutique Hotel offers a calm retreat without straying too far from the city centre. Those keen for some winter action will be glad to know that the famous Shymbulak ski resort is a 20-minute drive away, while summer adventurers can head to the nearby Medeo Gorge. Situated at the heart of the city and close to embassies, Rixos Almaty Hotel — with its vintage white and yellow façade — is hard to miss. 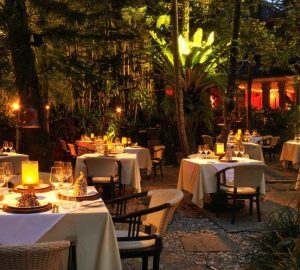 Inside, it is an oasis of tropical foliage and cool marble floors with a touch of Art Deco on the edges. Its Presidential Suite occupies 220 square metres and two floors, comprising three bedrooms, three bathrooms, a dining room, lounge, kitchen and balcony with mountain views. The interior theme is a study of colour and texture — think detailed carpets over wooden floors, or Victorian silhouettes paired with minimalist upholstery. The renowned Rixos Almaty Spa features a Turkish bath decorated with traditional Ottoman mosaics.